Good girls don't go to real parties, like the ones in the hood. Or rock bangin' clothes. Or stay out as long as they want. But I'm sick of my parents' rules and being the perfect little boring suburban princess. It's my life, right? I've decided to have some fun for a change, hitting the streets with my new bestie, Sasha. Best of all, my new gangsta-fine boo, Malik, knows how to treat me right, spoils me like I deserve, and is someone I can finally call my own. Sure, living the life and being with Malik is getting me into mad-crazy trouble. And if I don't tell the truth about him, I could go to prison. But a good ride-or-die girl never snitches. And as long as my friends and my man stick by me, nothing can go wrong, right? Amir Abrams is a regular dude with a dream. Born in Brooklyn, Amir has a thing for fresh kicks, fly whips, and all things Polo. 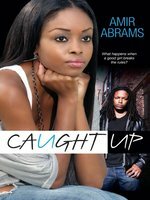 For Amir, writing teen fiction was never something he imagined himself doing until he started working with Ni-Ni Simone on the Hollywood High series. In addition to the Hollywood High series, he also penned Crazy Love, The Girl of His Dreams, Caught Up, and Diva Rules. You can hit him up at amir_abrams@yahoo.com, on Facebook at itsyaboyamir, or follow him on Twitter @ItsyaboyAmir. Copyright 2014 School Library Journal, LLC Used with permission.